Conference Chairman Peter Wong describes the Saturday lunch immigration panel, during which proponents and opponents of the law got a bit feisty. John Meyers of KQED in California used the conference to put his state’s budget woes in perspective. Rob Garrett of the Dallas Morning News blogged some home-state info about redistricting he gleaned at the conference. The good folks at State and Federal Communications attended as vendors and gave us a shout-out on their blog. Did you write live news off a conference session or have you put something you learned to work back home? E-mail it to mbinker@gmail.com and we’ll give you a shout out here on the blog. Gov. Bill Richardson speaks to reporters during Capitolbeat 2010. New Mexico Gov. 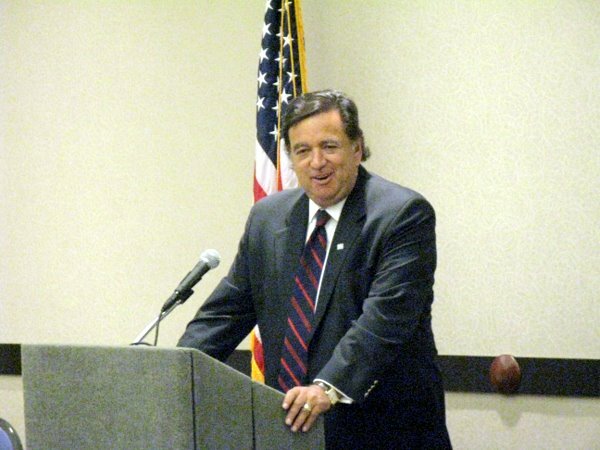 Bill Richardson spoke to Capitolbeat’s annual conference on Nov. 13, 2010 in Phoenix. During his 35-plus minutes Richardson discussed immigration reform, the new Republican majority in the U.S. House and the importance of statehouse reporting. You can click here to listen to Richardson’s remarks and his question and answer session. If you’re making last minute travel plans for Capitolbeat, you will find that our main conference hotel is booked. Not to fear: the Hotel San Carlos is a two-minute walk away and their rate is the same as the Wyndham. Click here to connect to their web site. Also, a quick check of weather.com shows that the highs in Phoenix this week are expected to be in the mid-to-high 70s with nightly lows around 50. Dress for the conference is business causal – no ties but a shirt with a collar might be good idea. Planning this year’s conference hasn’t been dull. But between logistical challenges, last-minute additions and some very kind offers from sponsors, we think we finally have it together. Please click here to download PDF with the final conference schedule for Capitolbeat 2010 in Phoenix. This is just a quick note to let you know we have updated our scheduled – yes again – for Capitolbeat 2010. Click here to download a MS Word file with the new lineup. Then, go ahead an click here to link to our conference page to sign up and book your hotel. 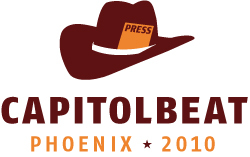 You’re not signed up for Capitolbeat 2010 in Phoenix yet? Why not? We know the story. You want some training – no – you need some time looking at new ideas and meeting with colleagues who understand the exasperations and joys of covering the state legislature. But there’s not just money in your newsroom’s training budget and there’s only so much you can shell out of your own pocket. Capitolbeat has a limited pot of scholarship money available and we’re going to try to make it stretch as far as we can this year. Hardly anybody should expect a full ride, but we’ll help as many people as we can with the money we have. Step 1: Register for the conference. Do not pass go and do not do anything else unless you have done this. Go to the conference page and fill out the online registration form. Don’t pay the conference registration fee yet, but we need to know you’re out there and that you’re interested in coming. Step 2: Figure out what your bosses or you yourself can pay for. We want to see our scholarship dollars go as far as possible, so if you we know you can pick up the tab for part of the trip we’re a lot happier pitching in. Step 3: Write us an e-mail. Send it to capitolbeat2010@gmail.com . You’ll get an acknowledgement in a couple days. Your e-mail should contain your name, newsroom affiliation, phone numbers and other relevant contact information. Send us a couple graphs letting us know why you want to come and what you need help with exactly. That’s it. We’ll try to let folks we’re going to help out know by October 15. A helpful hint about applying: It is easiest and most cost effective for us to help offset the registration fee or hotel costs. Travel costs, such as airplane tickets or mileage, will be considered in some situations. We will not cover items such as meals or a cab from the airport except in extraordinarily unusual circumstances. When you’re a reporter, you know the story is going to shift right up to deadline. A last-minute phone call clarifies an earlier conversation, a helpful fax nails down a key figure or new news refocuses the lede of the story. So it is with planning a conference. It’s safe to say our Capitolbeat 2010 session line-up will shift right up until we have to send the program to the printer — and maybe a few days after. But we have a pretty good sense of what Capitolbeat 2010 is going to look like and now you can too. Click here to download our tentative schedule as an MS Word document. Then click here or on our conference tab to sign up and book yourself a hotel room.